Oh, the magic of throw cushions! Having the power of instantly making your home a more inviting and cozy place to be, these elegant accessories are a must! If you are looking to bring your home design to a superior level, do not hesitate to add these small pieces of art to your collection of cool home improvement details. While looking for throw cushions, I am sure you will come across a wide range of them, including handmade cushions models which have the ability to give a special touch of warmth. But before choosing your favourite designs, consider the fabric they are made of. The first thing to keep in mind is where will you use them? Will you use them in the living room, bedroom or maybe for your outdoor space? After deciding, take a look at the following fabric guide to help you make the right selection. Linen and cotton are fabrics known as plant fabrics due to the fact that they are made from flax and cotton. Available in pure and blended form, these fabrics are ‘breathable’ and soft to touch, which makes them a fantastic fabric for throw cushions. Linen is much stronger than cotton and is considered a good conductor of heat. Plus, it is cool to the touch, which makes it an excellent choice for summertime. Linen and cotton cushions are ideal for kitchens and outdoor areas that are protected from weather elements. Both materials are easy to clean, which means they can be removed and washed. Silk is considered one of the most luxurious forms of fabric. 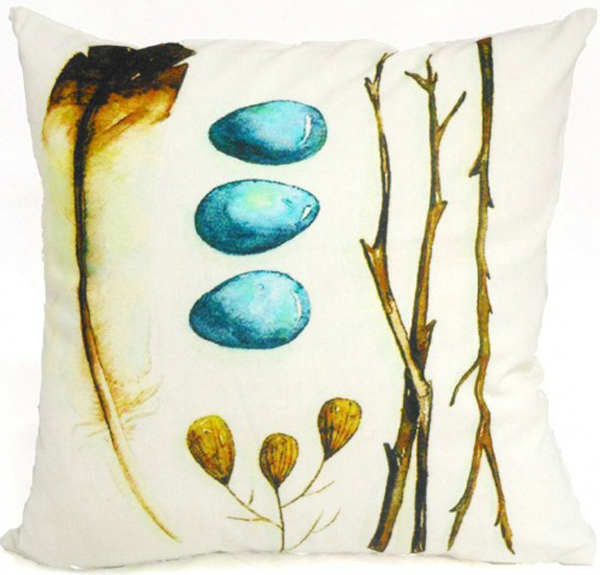 And when it comes to silk throw handmade cushions, they make a stunning addition to any living room. However, too much of a good thing can be a bad thing. To give a magic appeal to a certain space, make sure not to overstuff it with too much of this type of cushions. Just add one or two between cushions from other fabrics to enhance the texture of the room. It is important to mention that silk must be dry cleaned. This can become a major expense if you plan to do it regularly. So if you have small children or pets in your home, silk throw handmade cushions may not be the best choice for you. Leather is a material quite similar to silk. It is an animal product, it is expensive, it is difficult to maintain but it can add amazing texture to any room. Leather throw cushions are considered a slightly old concept and they are not the most comfortable option for cuddling. Moreover, they are not really practical for hot weather since they do not conduct heat well. So, unless you have a clear idea about how leather cushions can add texture to your room, you should keep leather only as a part of your wardrobe materials. Synthetic fabrics like polyester and nylon are made using a process of polymerization, which is a totally chemical process. These fabrics can feature different levels of quality and can be stain resistant, water resistant, winkle free, non-flammable, etc. And while speaking of throw cushions, these are the ultimate features to look for. However, the downside to this material is that it is not environmentally friendly. The chemicals involved in its production process come from coal, natural gas and oil, which means that this fabric is not biodegradable. Duck canvas and cotton canvas make an amazing choice for outdoor throw cushions. They are basic woven fabrics and the main difference between them is that duck canvas is smoother and more tight than cotton canvas. Duck and cotton canvas are much more durable and hardwearing than cotton and linen and that is what makes them the ideal option for outdoor furniture.